A high-quality pair of running shoes for women is essential for any runner, whether you are a casual runner, competitive athlete, or just prefer to run in local races and events. With a great pair of women’s shoes, you can not only enjoy more comfort when you exercise, but avoid potential injuries and issues while you exercise. There is no shortage of different types of best running shoes available for women, yet with so many different styles and brands of best running shoes out there; how do you choose the right running shoes to meet your needs? Well, when it comes to running shoes, you want something that is comfortable, supportive and durable enough to handle your workouts. However, for many shoppers, buying running shoes, or any new piece of clothing, also means making sure that they are an eco-friendly option. While the clothing and fashion industries are unfortunately known for not being the most eco friendly of industries, there are many companies and designers who are now making an extra effort to be more environmentally friendly with their products. This includes high-quality running women’s shoes. This is why we have taken the time to not only look at some of the most popular, high-quality running shoes out there, but to also look at brands that are doing their part to be more eco-friendly in their practices as well. Using these parameters, we have created our list of our top eco-friendly women’s running shoes and accessories from socks to shoe laces so you can find a comfortable, reliable pair of shoes that you can feel good wearing and feel good about buying. This pair of Columbia running shoes for women is super-cushioned for all day comfort. It is a great option for walkers and runners and the extra cushioned support also make them popular for those with shin, joint and knee issues. Columbia Sportwear is known for creating outdoor gear that can easily withstand the elements while providing a stylish and budget-friendly option for clothing, shoes and accessories. However, one of the many reasons our Columbia review made our list of top eco-friendly running shoes is because they believe in reducing their environmental impact for years. They proudly offer eco-friendly and sustainable products, and use responsibly sourced materials like recycled polyester. They also have their Rethreads program which encourages customers to recycle used clothing and shoes. If you are looking for a stylish pair of running shoes for women, this pair from DressLily. We love this online boutique because they have a number of eco-friendly products, including clothing, shoes and accessories made from sustainable products. 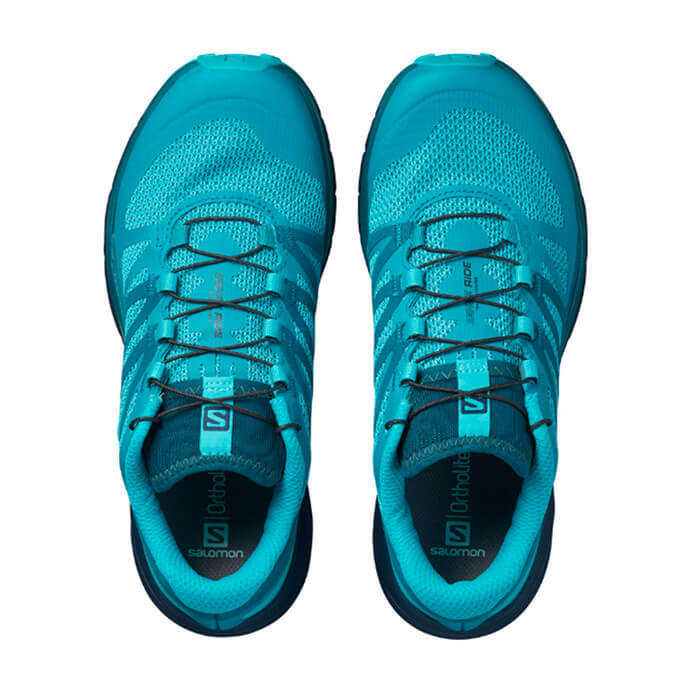 We included this DressLIly review not only love these shoes because they come from a brand that values sustainability and eco-friendly practices, but because these walking / running shoes are a great option for all types o workouts. These shoes are super breathable and made with a lightweight mesh that will keep you cool, no matter how hot your workout gets. While most people know New Balance for their lifestyle gear, this company has all type of athletic apparel and accessories, including this pair of running shoes. These shoes are great because they are waterproof and can be worn when surfing, working out or running on the beach. We included the New Balance review because they are not only committed to doing their part to protect the environment, but they also have other philanthropic efforts including their support for Susan G. Komen. Since 1989, the Susan G. Komen program with New Balance has worked together to find a cure for breast cancer. New Balance also sponsors racers in the Susan G. Komen Race For Cure Series. These trainers from Joules are the perfect fashion pieces for your everyday wear. Designed to be both stylish and comfortable, these shoes are great for walking around every day. Joules is one of Britain’s most unique clothing brands and is known for creating bright, timeless designs for the whole family. This brand is also dedicated to giving back. We included this Joules review because this company has a long history of supporting their local communities and have a number of charities they work with including Princes Trust, Hospice UK, Nuzzlets and Farms for City Children. If you are looking to buy tennis shoes from a company that gives back and want to make a purchase you can feel good about give Joules a try. We love these Orvis hikers from Merrell because they are light and comfortable and the perfect running shoe for walking, cross training or trail running. They are durable, comfortable and perfect for all of your outdoor adventures. Orvis is known for selling high-quality gear made for all of your outdoor adventures. We included this Orvis review because this company is not only known for their quality, but for their commitment to the environment. Orvis is dedicated to protecting nature with their practices. The company gives 5% of their pre-tax profits to protecting nature and happily donates to wildlife and environmental organizations around the globe. We love these U.S. Outdoor Salomon Sense Ride women’s running shoes because they are designed with comfort in mind and created to provide the utmost in support while you run. This shoe is best used for trail running, but can be used for a variety of outdoor activities. These women’s shoes are offered by American-based U.S. Outdoor, a Portland company that is dedicated to outfitting consumers with everything that they need in order to get out and enjoy the outdoors. They are also committed to helping to keep the environment safe and healthy for even more people to enjoy. We included the U.S. Outdoor review because the company not only has their own sustainable practices, but they have also partnered with a number of other organizations that are dedicated to preserving our planet. This includes the U.S. Forest Service, Mt. Hood Meadows, Friends of Outdoor School and more. This company loves partnering with other local organizations to help make a positive impact on their community. With this pair of running shoes you can handle any outdoor activity whether it is a 5K, Half Marathon, or even a Tough Mudder. Yes, this pair of shoes is one of the best running shoes that is actually sold by the popular race organization, as they are tough enough to handle all of the mud, dirt and obstacles that this race throws at its participants. We love that this shoe can handle virtually anything and it is east to wash and wear again. These shoes are made specifically for Tough Mudder events and even have the company logo on the side. This isn’t the only unique thing about this mesh running shoe. It is also Vegan-friendly, making it a shoe you can feel good about buying. Plus, we love Tough Mudder review because the company gives back to charity and supports several philanthropic organizations such as Team Rubicon. With these natural mesh sneakers from United by Blue, you will stay cool and comfortable, no matter what type of workout you have in front of you. However, what we love most about this United by Blue review is that these sneakers are actually made by Forsake. Forsake values the outdoors and has committed to making a product that leaves a small carbon footprint with less impact in the environment. Secondly, for each item purchased on United By Blue website, one pound of trash will be picked up from the organizations efforts to help clean up communities one pound at a time. These running shoes also have a vegan jersey lining made out of recycled polyester and a logo that is made out of wild rubber. The PU sole is also made of 50% wild rubber from the Amazonian forest. Finally, the logo on these fun mesh sneakers is made out of 100% organic cotton. Talk about a green pair of running shoes! With this fun accessory, your running shoes will never come untied when you are hitting the pavement. With HICKIES, you never have to worry about tying your shoes, or having your shoes come united and tripping you while you work out. They also help make your shoes more adjustable and fit better. We love that this US-based company is changing the way that people are tying their athletic shoes. What’s better is that a single HICKIE can replace dozens of shoe laces over time and we love nothing more than to think of how they are reducing their carbon footprint by reducing the number of wasted shoelaces in the world. This isn’t the only positive impact HICKIES is having on our world today either. We included this HICKIE review because this company is dedicated to their charitable efforts and has even partnered with the Autism Society, an important organization that is helping the world understand and support the development of those with this condition. Every pair of good running shoes needs a pair of running socks. When it comes to finding a pair of socks we love nothing more than these from Sock Problems. When you buy this Rainbow Pow Sock, 50% of the expenses are given directly to the Trevor Project. This is the leading national organization providing crisis intervention and suicide prevention services to the LGBTQ community ages 13-24. The company has all types of unique socks that are designed to stick out, get noticed and support charities in need. The more socks they sell, the more money goes to the charity that sock supports. So next time you are running in a 5K, slip this pair of socks on, it will get you noticed and help you raise awareness for some great causes. With these Swiftwick running socks you can enjoy a lightweight, comfortable feel that will keep you cool and confident during your run. These socks are not only great for running, but for other activities such as cycling as well as they are made with Nylon and Olefin that wicks away moisture. We included the Swiftwick review because they are also US-made, so you can feel good about boosting our economy when you buy these sustainably produced socks. The company not only manufactures in the USA to reduce garment miles but they specifically choose materials that minimizes energy consumption and waste. With these Darn Tough running socks, you can enjoy both comfort and style whenever you work out. This lightweight, cushioned, no-show sock has fast action wicking features and is naturally antimicrobial. This means that they repel bacteria and odor naturally without any harmful chemicals. We included the Darn Tough review because we love that these socks are guaranteed for life! One of the best features however, is that all of the socks are knit right in the USA. This Vermont-based company purchases raw materials both in the US and abroad and makes all of their products right in their Northfield, Vermont factory. With these FITS running hiking socks you can enjoy a lightweight, comfortable feel that will keep you cool and confident during your next hike up the mountains. These socks are not only great for running, but for other activities such as hiking as well as they are made with Merino Wool, Nylon, Polyester and Lycra that wicks away moisture. We included the FITS review because they are also US-made, so you can feel good about boosting our economy when you buy these sustainably produced socks. The company not only manufactures in the USA to reduce garment miles but they specifically choose materials that minimizes energy consumption and waste. FITS is truly an American company. Next on our list is our STIO review. These running shoes offer a lightweight and flexible design. The shoes are qualified as an approach shoe. What’s an approach shoe? According to wikipedia, approach shoes are considered to be a hybrid of a traditional hiking boot with rock-climbing shoe. In other words, the STIO Scarpa Crux Canvas shoe is ideal for the perfect trail run in the woods. You can enjoy a lightweight, comfortable feel that will keep you cool and confident during your next hike up the mountains. We included the STIO review because they are also made with upcycled material including recycled polyester lining. Lastly, STIO is committed to doing the right thing and everything that they do to help protect the planet. Running shoes for women can undoubtedly make all of the difference in your workout and how you feel when you exercise. If you invest in a great pair of running shoes, running shoe laces or running socks, you can enjoy a more comfortable and productive workout each and every time you run. However, with the products on our list, you can not only buy running gear that will benefit you, but running gear that will benefit our planet as well. These eco-friendly options are made in the USA, ethically sourced or give back to charities in need. Make sure you look through this list of products before you invest in new running gear—it features companies and products we know you will love to support.